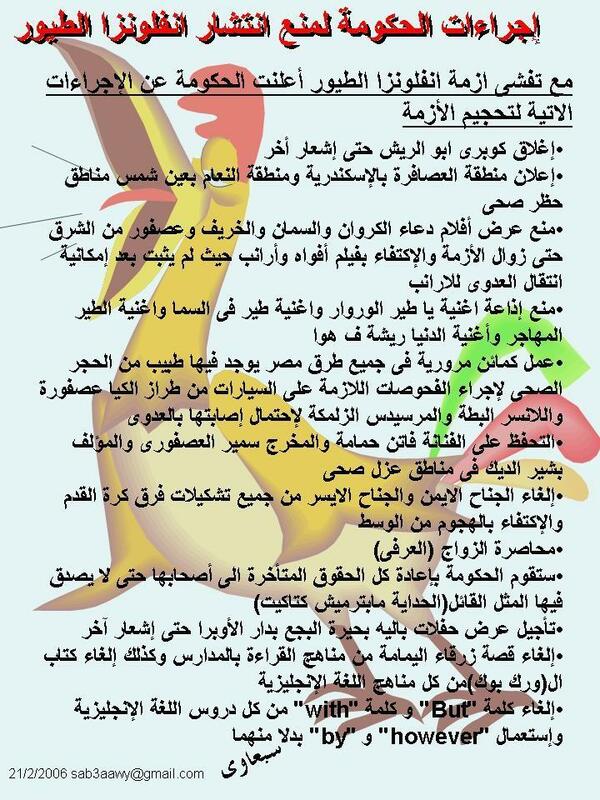 According to official news , we are still free of bird flu in Libya even though neighbouring Egypt has discovered some cases - that in itself is a joke. Whatever . A bear, a lion and a chicken meet.The bear says: "if I roar in the forest, the entire forest is shivering withfear. "The lion says: "if I roar in the jungle, the entire jungle is afraid of me. "Then says the chicken...."Big deal. I only have to sneeze and the entireplanet shits itself." You are right Adam , however joking is a way that our populations have used for decades to help them survive the harsh realities. Egyptians are famous for some of the best jokes ! Back on track... My mother doesn't want any birds around our house (in Benghazi,) so my parents sprinkle bird poison on the roof so no birds would nest there. The other day, they found a dead pigeon, and guess what. Gloves and masks came out... "The bird flu is here," declared Dad. After consulting with the neighborhood "experts" and “dignitaries,” they opted to bury the bird instead of burning it, and to sanitize the whole roof. Now, everybody in the neighborhood is on alert for dead birds. Hanu that's so scary about the bird curse in your family but thank you for sharing with us . HL, the story was meant to entertain you not scare you :-) I don't believe in this stuff anyway. I found it funny that no one thought the bird died of eating the poison!